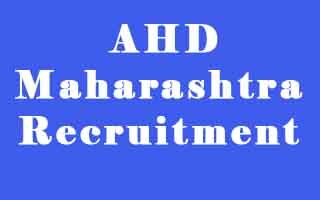 AHD Maharashtra Recruitment 2017: Animal Husbandry Department (AHD), Maharashtra has released the online application on www.cahexam.com for recruitment of 138 various posts. Candidates can fill their application through online from cahexam.com / Ahd.maharashtra.gov.in on or before 25.07.2017. The details regarding AHD Maharashtra Recruitment 2017 is given below. Maharashtra Animal Husbandry Department is going to recruit 138 posts of Livestock Inspector (LSI), Senior Clerk, Stenographer, Driver and other posts. Candidates belonging to any category can fill online application for this recruitment through online. The process of filling online application has been started from 7th July 2017. All eligible candidates may submit their application by login on www.cahexam.com. Before going to register online for AHD Maharashtra Vacancy 2017, you must visit the official website Ahd.maharashtra.gov.in and read carefully of all instructions. Here, we are sharing some important information related to AHD Maharashtra Bharti 2017. You should check out the detailed information about "how to apply?, Eligibility Criteria, Application fee etc. in official notification. The download link of Official advertisement is given below. Livestock Inspector (LSI) [पशुधन पर्यवेक्षक]: Candidates must be passed SSC exam with a degree in B.V.S.C. Senior Clerk [वरिष्ठ लिपिक]: Candidates should be Graduate. Clerk-Typist [लिपिक – टंकलेखक]: Degree with Typing speed of Marathi (30 wpm) & English (40 WPM). Stenography speed of 12p wpm in English and Marathi & Typing Speed - Marathi-30 wpm and English-40 wpm. Stenographer (Lower Grade) [लघुलेखक (निम्नश्रेणी)]: SSC with Stenography speed in English and Marathi (100 wpm) with typing speed in Marathi 30 wpm and English 40 wpm. Driver [वाहन चालक]: Applicants must have passed class 10th / SSC Exam and have a valid driving license (HMV /LMV). Age limit: Minimum 18 years and Maximum 38 years as on 6th July 2017. Note: Candidates are advised to visit the official website (www.cahexam.com or Ahd.maharashtra.gov.in) and download official notification of AHD Maharashtra Recruitment 2017. The details about eligibility criteria have been given in notification. You must read all required details for the post and then proceed to submit your application. Application Fee: Rs.300/- for Un-Reserve categories and Rs.150/- for Reserved category candidates. Candidates who are willing to apply for AHD Maharashtra Bharti 2017, open the website www.cahexam.com and follow the instructions to register online. After registration, you may fill your details in the online application format. Click on the post Name for which you want to apply. Now, Go to Next page by clicking on "OK". If you have not registered before, Click on "जिस्ट्रेशन" (Registration) and fill your details. During filling your application, the SBI Bank challan will be generated. You should print the SBI Fee Payment Challan and pay the fee in State Bank of India branch. Applicants can pay the fee through Online Fee Payment option. After submission of online application, candidates should take a print copy of online application form. The Candidates can download AHD Maharashtra Admit Card 2017 by using application no. / Registration Number and Date of Birth. So, keep safe the hard copy of printed online application form. Starting date of online Registration 7th July 2017. Last date of Online Registration: 26th July 2017. The last date to submit application fee: 28th July 2017. For more details related to AHD Maharashtra Bharti Examination 2017, please visit www.cahexam.com and check the detailed information about the same.